Our Silk Impression fabric features the same light, delicate and luxurious appearance of real silk, but it's more cost effective and easier to care for. Your unique designs are printed using dye sublimation in gorgeous full colour. Make your own clothing accessories, bag linings and fashion apparel with custom silk impression printing. Choose our alternative silk fabric for your next fashion, craft or DIY project at home. It has the same appealing properties you'd find with natural silk, but with a more cost-effective price tag and easier maintenance needs. The tight plain weave construct prints both intricate details and solid block colours equally well, so whatever your unique design is, it looks amazing on silk impression. Thank you very much - I was delighted with the quality of the Organic Cotton Poplin fabric and my simple design printed beautifully - it feels lovely. I also got some of the swatch packs which will be very useful for future orders. Despite being thin and delicate, it's a surprisingly tough fabric that doesn't have fussy maintenance needs. Machine wash at 30°c, hang to dry or tumble dry on medium. It's also safe to iron on a low heat, ideal if you're making shirts and other fashion items. What Exciting Things Can I Make Using Silk Impression Fabric? 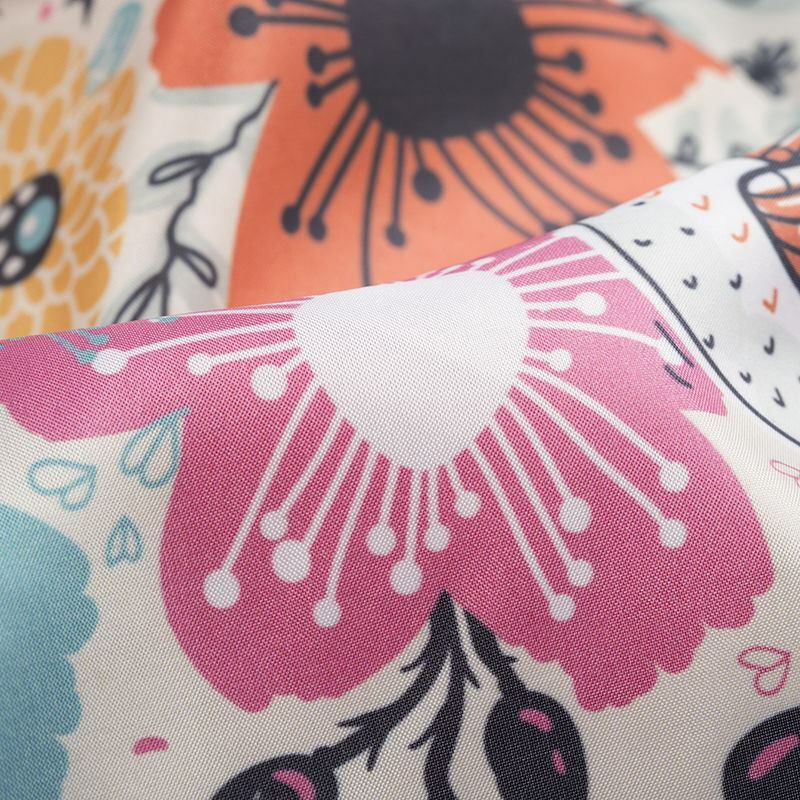 It's a very desirable fabric to work with, so it's ideal for a number of creative projects. Got an old bag that needs a makeover, or bought a bag that has a bland, dark interior? 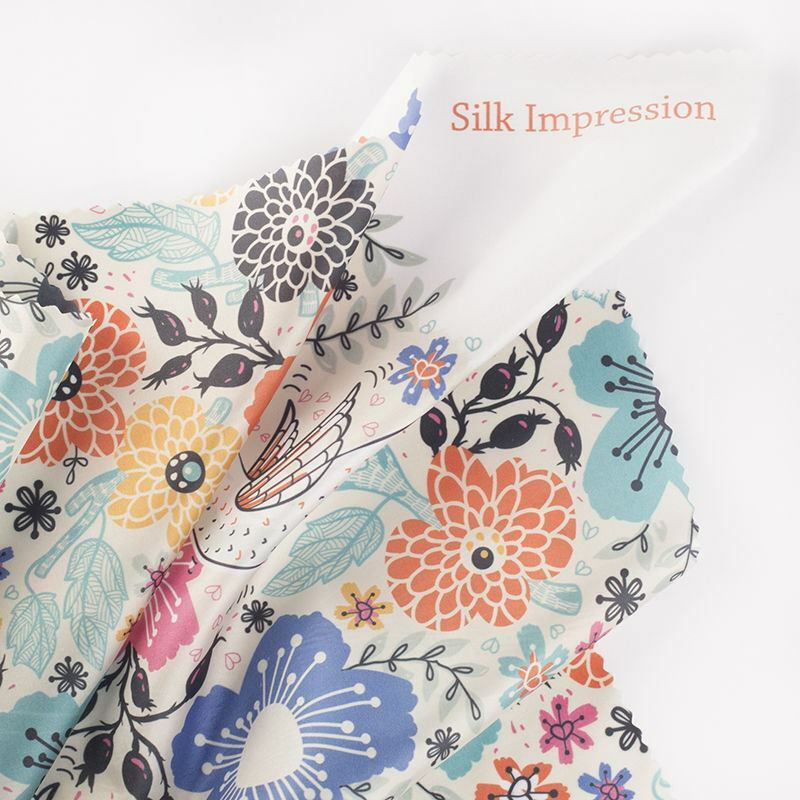 Try silk impression printing and sew a new, fun lining into your handbag. You can also make cute clothing embellishments like pocket squares and peter pan collars. It's a firm favourite with fashion designers, given the natural elegant drape, so pick a flattering shirt pattern and make a cool piece of clothing that none of your friends will have. Try our alternative impression silk fabric, and marvel in the wonderful quality and smooth texture. To guarantee a bold, everlasting print for your custom designed silk impression printing, we use dye sublimation. This process bonds the eco-friendly ink deep into the textile so it won't run away or come off in the wash. This poly-blend material is woven in a tight plain weave, so fine details and lines come through crisp and clear. Perfect if you've got an intricate pattern. You can choose photos, graphic designs or your own artwork to have custom printed on your silk style fabric. When you design your alternative silk fabric, you'll notice there are 4 edge finishing options: cut on the line, hemmed with white thread, hemmed with black thread or left as it is with a rough cut.